Along with the Calgary Flames, the Montreal Canadiens will be unveiling their new Rbk EDGE uniforms tomorrow. To get everyone ready for that, I have concepts. Unlike the the Flames, the Habs haven't really leaked anything whatsoever regarding their new sweaters. I don't know of one solid rumor or suggestion thereof that we have to go on. It's going to be a total surprise. Or else, they won't change a thing and simply adapt the present design to the new cut and style like the Red Wings and Rangers have. This concept is based off of the New York Islanders' new duds. They're pretty sharp and would probably go without too many complaints from Habs fans. 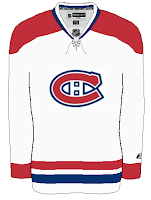 This fan-created design is closest to what the Canadiens wear as a road jersey at the moment. The white one above seems more like the vintage alternate jersey. Not that there would be anything wrong with either. 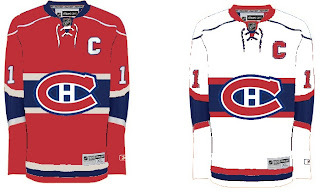 But I've been reading comments from Habs fans who would like to see a new road sweater more similar to that one. If you're a fan who fears these uniforms will be too busy and feature an overabundance of striping, don't look now, but we have concepts to scare you. Whoever wears those jerseys will need pretty big shoulders to fill them out. I'm not entirely convinced those aren't football jerseys. Anyway, I've also got a fan-created logo redesign to show off. What do you think? Personally, I like it with the "H" in the middle and would hate to see it change. Furthermore, it won't change. The world will end before the Canadiens get a new logo, of this I'm quite certain. Perhaps it's my crystal ball or perhaps it's an understanding of human behavior and an overwhelming hatred of change in the hockey world. Anyway, hope you've enjoyed what you've seen while you wait for the new sweaters to be unveiled tomorrow at some point. This goes for the Flames as well as the Habs, but naturally, as soon as I can post pictures, you know where to find them.